When billionaire Chris Cline’s company bought an option to mine a swath of northern Wisconsin in 2010, the company touted the project’s potential to bring up to 700 well-paid jobs to a hard-pressed part of the state. Since the Supreme Court’s 2010 Citizens United ruling, which allowed corporations and unions to spend unlimited amounts on politics, hundreds of millions of dollars have flooded into the political system — much of it through nonprofit groups that have no legal obligation to identify their donors. Usually such efforts remain hidden from view, leaving voters unaware of who’s paying for the gush of campaign calls, flyers and attack ads. But a court filing recently made public by a federal appeals court in Chicago provides a rare look at how so-called “dark money” groups helped one company get what it wanted. Both nonprofits worked to pass the mining bill. One helped to write the measure and launched a radio campaign even before it was introduced. The other tried to pressure a Republican holdout. Together, the two groups played a critical role in defeating a freshman Democratic state senator who’d voted against the bill, paving the way for its passage months later. After the 2012 elections, some observers downplayed the impact of dark money groups after most of the candidates supported by the largest one, Karl Rove’s Crossroads GPS, lost. As this year’s elections approach, the Cline Group’s strategy in Wisconsin reveals the much bigger impact such groups can have in state races. Here their money goes much further, in some cases dwarfing the amount candidates themselves spend on their campaigns. In an interview, James Buchen, a former WMC vice president, said the group’s efforts on behalf of the mining bill were no different from its support of other pro-business legislation. “Our interest in this was trying to create an environment where someone was interested in coming and mining in the state,” said Buchen, who left in 2012 to start a lobbying practice. A spokesman for Gogebic Taconite, Cline’s Wisconsin subsidiary, did not respond to requests for comment. Still, documents and interviews show that Gogebic’s money secretly made its way into the political battle over the mining law — and that the efforts of the WMC and the Wisconsin Club for Growth significantly swayed the results. Sen. Dale Schultz, R-Richland Center, the veteran legislator targeted by one of the groups, said Gogebic’s efforts to hide its influence went beyond anything he’d witnessed since his election to the state assembly. “I’ve never seen anything like this done by special interests in Wisconsin in 32 years,” he said. The battle over the mining bill began in 2011, months after the Cline Group announced plans to apply for a permit to build an iron mine in the Penokee Hills of northern Wisconsin, not far from the Lake Superior shoreline. Gogebic began working with two Republican state legislators on a bill to speed up the process of securing a permit, the Wisconsin State Journal reported. Without the legislation, a Gogebic official told the paper, the company “would have to re-evaluate” whether it wanted to build the mine. “I wonder how they did that so quickly when this is a bill that I just saw for the first time,” said Rep. Janet Bewley, D-Ashland, in an interview with Wisconsin Public Radio at the time. Bewley represents the area where the mine would be built and later voted against the legislation. Weeks later, the WMC started running radio ads touting the bill, even though it still hadn’t been formally introduced. 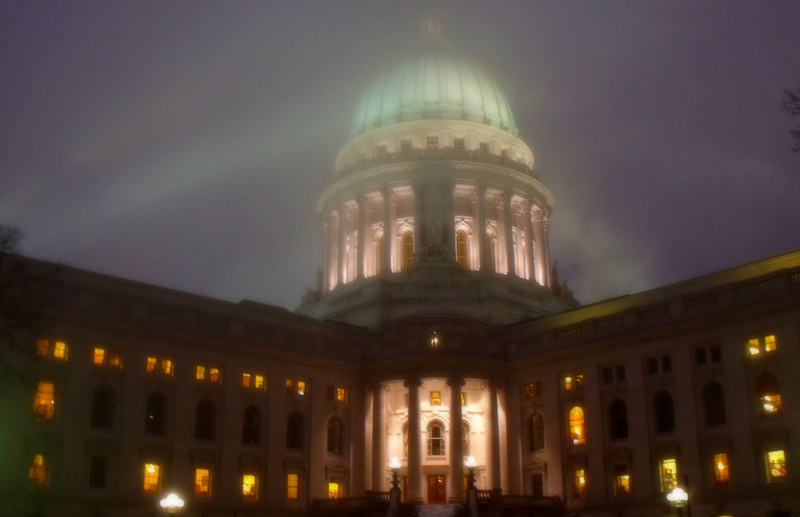 Gogebic and the WMC, according to media reports and interviews, played a key role in shaping the language of the bill. Shortly after it was introduced in late 2011, the Milwaukee Journal Sentinel reported it had been written by five Republicans in close consultation with Gogebic and the WMC. In an interview, Buchen said several groups, including Cline and the WMC, gave input on the bill. But one Republican lawmaker, who requested anonymity to speak candidly, acknowledged that “the initial bill that came out was for the most part written by” the mining company. A former University of Wisconsin rower, with thinning hair and a mustache, Schultz, 61, represents an independent-minded district west of Madison. He’d endorsed Walker early in his run for governor in 2010, and maintained a conservative voting record. The WMC had even given him one of its “Working for Wisconsin” awards, honoring him for his “pro-jobs voting record” in the 2011-2012 legislative session. But by the time Schultz won, one staffer said, the WMC was so displeased he wasn’t supporting the mining bill that it skipped the usual photo-op and dropped off the plaque in a plastic bag. Schultz agreed that mining regulations should be streamlined. But he’d seen how lead mining had so polluted Brewery Creek in his district that it ran red for decades after the mines had shut down. “I understood the consequences of mining done poorly,” Schultz said. With Schultz’s vote in doubt, two lobbyists — Bob Seitz, who worked for Gogebic, and Scott Manley, who worked for the WMC — visited him on several occasions. But that wasn’t all. The Wisconsin Club for Growth launched a robocalling campaign, urging voters statewide to call his office and tell him to vote for the bill. And it used its blog to smear his record, with a post titled “Used by the media, respected by no one” and calling him a RINO, or Republican in name only. After several constituents called Schultz’s office to complain, Schultz confronted the lobbyists about the calls. “You can tell your buddies, if they’re making those calls in my district, they can keep doing them, because they’re making me a folk hero!” Schultz told them, according to a staffer who witnessed the conversation. On March 6, Schultz cast the deciding vote against the mining bill, the only Republican to oppose it. Hours after the vote, Gogebic’s president said in a statement that the company was scrapping plans to build the mine. “We get the message,” he said. Despite Gogebic’s public proclamation, the WMC remained committed to new mining legislation. But its tactics changed. King, then 37 and a bankruptcy lawyer, had spent part of her childhood in Wisconsin’s foster care system and worked in a juice box factory after high school before going to college and getting a law degree. She’d been elected by a slim margin in 2011, and her race was widely seen as the closest senate contest in the state. More than 85,000 people voted in King’s race. She lost by 600 votes. In a blog post two days after the election, the Wisconsin Club for Growth bragged that it had played a “pivotal role” in the results, airing more than $1.5 million worth of ads in Green Bay “to educate voters on the records” of King and another Democrat who had voted against the bill. “The mining law we have today would never have happened if Jessica King had won re-election,” said Sen. Tim Cullen, D-Janesville, who helped craft an alternative mining bill. But she had no way to know for sure until August, when a legal filing was inadvertently made public by a federal court. The filing was part of a lawsuit contesting an investigation launched by the Milwaukee County district attorney into whether Walker’s gubernatorial campaign illegally coordinated with several nonprofits, including the Wisconsin Club for Growth. The document was supposed to be under seal, but it was mistakenly posted on the court’s website for several hours before being taken down. A paragraph deep in the 24-page filing states that Gogebic gave the group a total of $700,000 in 2011 and 2012, according to bank records. The document doesn’t say whether Gogebic also gave money directly to the WMC. “The Gogebic spending — I don’t think anybody was aware of the amount or the degree until after the legislation was signed into law,” said a GOP legislator who supported the bill. Social welfare nonprofits are required to devote the majority of their efforts to “the promotion of social welfare,” not political activity, but the IRS has never specifically defined what that means and seldom challenges what groups report they spend on politics. The Gogebic case illustrates the challenge voters across the country face in parsing who’s funding the election ads they see, and to what end. Some Wisconsin lawmakers suspect the full amount the mining company poured into such groups may never be known. After the election, Jauch tried to find out who’d been responsible for the last-minute ad blitz against him. Eventually, he said, he spoke with a former official who had worked on a contract for the mining company. The official confirmed that the company had given money to the WMC to pay for the ads. “That’s the closest connection I can make,” Jauch said. Do you know of dark money groups spending heavily in state legislature races near you? Please email theo.meyer@propublica.org. Read ProPublica’s coverage of dark money in America, including how easy it is for nonprofits to deceive the IRS and how the head of one group made millions by contracting with own companies in 2012.